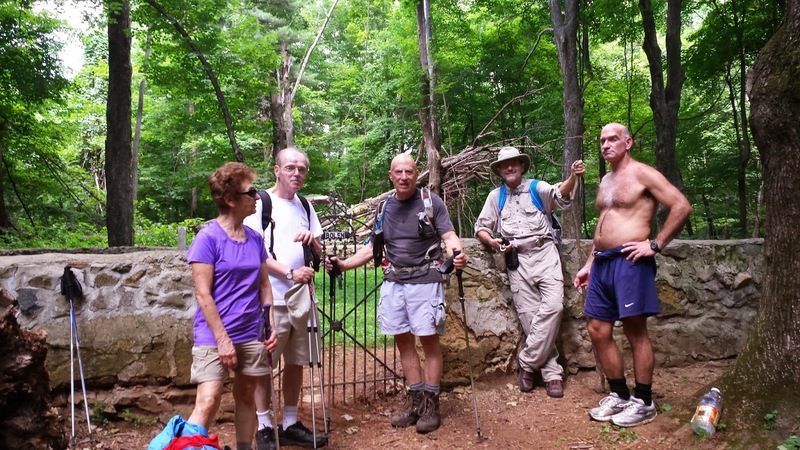 Kelly O’Rourke was joined by Michael Seth, Douglas May, Bev and Pete Fink and John Brandt to walk the ~7.5 mile loop. The weather was really nice we really had a great time. Most of the streams were dry and posed no challenge. This is a very pretty hike as the rock formations are amazing and walking along a stream to hear the water gently cascading most of the way is always pleasant. One of my favs for sure! In a Spring of weekends with incredible weather, this weekend was no different. A stalwart group of 10 met to tackle the rugged terrain at the Vining and Mutton Hollow Tracts to help District Manager of Trails Bill Holman blaze new trails, and check the condition of others which do not have current overseers. We convened in Lydia to consolidate cars and save the undercarriage of those with low ground clearance for the road to the parking lot. Today Marian Styles was free from her house renovation projects and able to return to the trails, as well as Eileen Seaman, Dave Borszich, and GPS aficionado Douglass May. Jesse Barnes returned for this arduous day with his family otherwise entertained and he was a huge help with the heavy lifting. Norman Beil was back in Charlottesville for the summer from his teaching duties at Rowan College. Andy Willgruber, Briana Taylor, and Michael Seth met the group at the trail head to complete the group. Briana lead quality control on the blazing projects as Andy forged ahead looking for and dispersing blow-downs. All members of the group took turns with the loppers, saws, and limb removal. After surviving the stinging nettles on the Cliff Trail, we enjoyed lunch at the Johnson cabin outdoor “Kitchen” and picnic table where Bill had hung Iva’s lunch from the rafters, allegedly to keep from the mice, though it seemed sneaky place to hide (Bill's comment: "It wasn't hidden!") a wrap. After our respite, we aided Bill removing a large limb from the CCC road which required chainsaws and heavy lifting. Our final work of the day was blazing and removing the downed trees Bill had cut into pieces along two new trails created during an Alternative Spring break group from UVa. Instead of heading for the sun and sand during spring break, this group chose to stay in the Mutton Top cabin for a week and clear new trails. While much of the trail was cleared, it had not been blazed, so it was starting to grow up again. Our group will tell you that this new trail needs some work, as it results from run-off from the mountain above and as we descended the very steep grade, we thought an accurate name for this new trail should be The Poison Ivy Ankle Breaking Trail. Bill didn’t approve this name. It was rugged, with lots of rocks, but it is now blazed! As it was now mid-afternoon, the Orion Trail did not get its blazes, as we had intended. We hiked to Butternut Hut to meet others who were assembling for the evening dinner. Butternut Hut allows trail workers a place to spend the night without renting a cabin. Bill hosted dinner for his trail overseers, most of whom had never met. So the day trail workers headed back to Charlottesville after a day of productive trail work. As they departed, Geoff Manning-Smith and Vivi Rogers, and her dog Charley, began work on other trails. Geoff won the Hawksbill Award last year for his dedicated work on the trails here. Also, driving up in the afternoon to work on their trails were Marit Gay and Mark Trail. Having just completed a cross country bike ride, their next focus was making sure their trails were in good shape! Once they were finished trail work, Marit, Michael, and Iva returned to start work on blazing the Orion trail, which was becoming so overgrown that it was hard to find. With some blazes in place, hikers will help keep it in better shape. Later, Mark and Ruth Walkup arrived for dinner. The Walkups live close by, are trailseers, and check these trails often. I hope they will hike with us in the future, as they are a fascinating couple, having lived in Africa for many years. Needless to say, Michael Seth and they had some terrific exchanges about international cultures. Finally, CJ Woodburn arrived, after pre-hiking with Kelly O’Rourke for a future hike. Volunteer work in yet another form. While we had 12 for dinner, 6 stayed for the night. It was the perfect night for camping with nice temperatures. If anyone has potential interest in being a trail overseer, the Vining Tract is a great place to get started. As VP Andy stated it, this is like trail maintenance with training wheels, since many of the trails are short, and tools do not need to be carried as far. Contact Bill Holman if you might want to try your hand at some easy trail maintenance. Thanks to all for your hard work, good food, and camaraderie during this fun filled weekend! A little overcast, but nonetheless a good day for a hike. 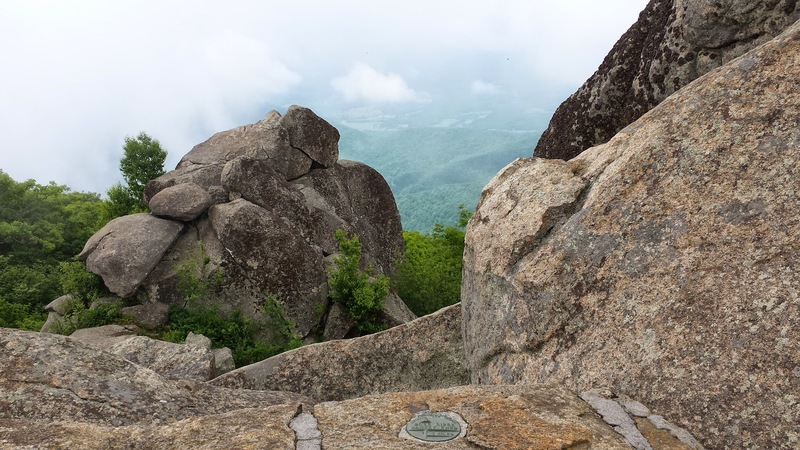 Nine hikers met at Reed's Gap to hike Three Ridges up to Hanging Rock and back. The group included Douglas May, Pete & Bev Fink, Marit Gay (leader), Lindsay Brown, Connor Anderson (Marit's nephew), Mark Perschel (co-leader), Emerald Young, and Leon Gorman. We made the 7.8 mile entire trek by 2:30 pm hiking up to 3,400 ft where we enjoyed lunch and homemade bars at Hanging Rock. On our return the skies started to spit a bit, but fortunately did not bring too much rain. We met many backpackers going to Maupin Field Shelter and Harper's Creek Shelter. Another fairly cool day in July. Weren't we lucky? 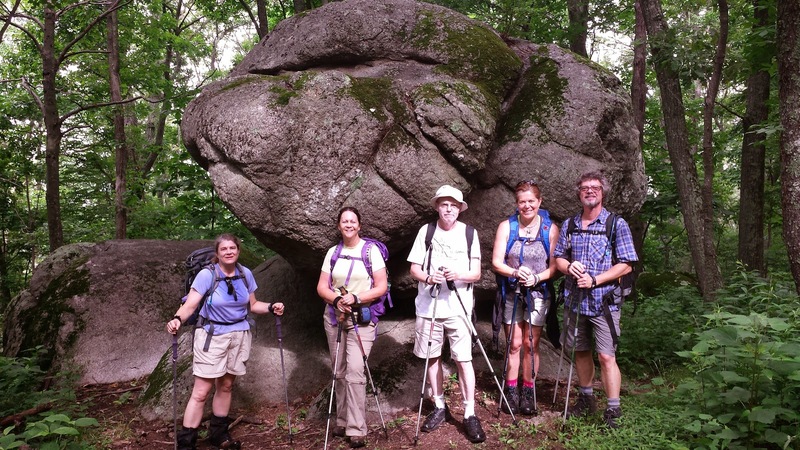 Six hikers came out for the mid-week hike on July 16. The outing had to be postponed from the day before due to a funeral attended by hike leader, Marit Gay. Unfortunately this reschedule left out Emily Whitworth and Mike Smith, but the other hikers were able to make the second date, including Dave Borszich, Michael Seth, Anne Colgate, Kelly O'Rourke, and Mark Perschel. We met at Reed's Gap and walked the AT south to Maupin Field Shelter intersection, snacked, then proceeded to the Three Ridges Trail. Climbing toward the summit the view from Hanging Rock was spectacular on an ideal day of cool, breezy weather. Everyone indulged in their healthy lunches followed by homemade chubby chews at Hanging Rock. The hike continued down towards Chimney Rock with many consultations with Michael and Anne about wildflowers and other plants. Columbine, Turk's Cap lily, and jewel weed were just a few of the many species we saw. Eventually we reached Harpers Creek Shelter and finally the Mau Har Trail as we climbed back north and upward Campbell's Creek. The water was quite low making the stream crossings easy, and the stinging nettles were not as troublesome as we had anticipated. When we made it by the Maupin Field Shelter we met a German AT thru hiker and a section hiker preparing their dinner. It was a long, but wonderful day - 13 miles - as we returned back to Reed's Gap. On the last chapter trail maintence trip in June, we noticed a relatively small tree across the trail but lacking a saw and energy, left it. 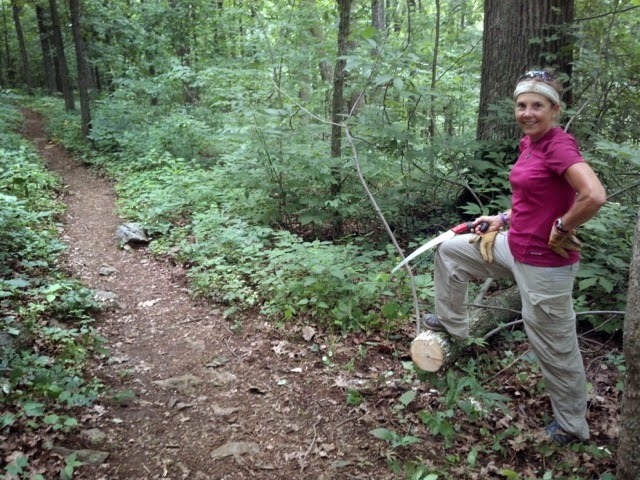 Then Pete and Bev Fink reported it, with good location data, so on June 26, Marit Gay and Mark Trail stopped to remove it before continuing north to keep Marit's section of Appalachian Trail clear. On June 28, John Shannon returned to McCormick Gap to clean waterbars and remove some invasive plants. Attendees: Iva Gillet, Dan Ralston, Jeanne Densmore, CJ Woodburn, and Michael Seth (some of us were expertly chauffeured by Bill Holman). Started at the Peaks of Otter (PoO) lodge and hiked up flat top mountain where we crossed the blue ridge parkway past the flat rock parking lot to the Fallingwater Cascade. Leave the PoO lodge and walk the other way around Abbott Lake past the nature center and around Harkening Hill Trail to Johnson Farm trail loop. 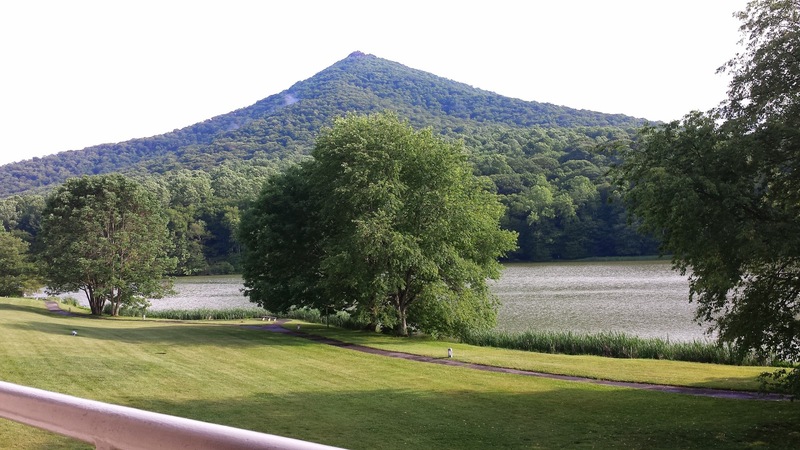 We then crossed the road to enter the parking lot to go to the top of Sharp top mtn. (1.5 miles up). It was a beautiful hike, though we would have appreciated it if the weather would have cooperated a bit more as we were not able to see anything except for the faint glimmer thru the clouds for a minute. We need to go back, because this would be a really spectacular view from the top! es trail loop (loop is 1.6M) and hike back to the lodge. This was a very beautiful hike with many enormous trees. No stream crossings. Not much water in the falls, but a good time was had by all.